Cook pasta in boiling water for 7-10 minutes. While pasta is cooking add all asparagus ingredients and sauté for 2-3 minutes. Set aside. Add all ingredients for mushroom sauce to food processor, blend until creamy and smooth. 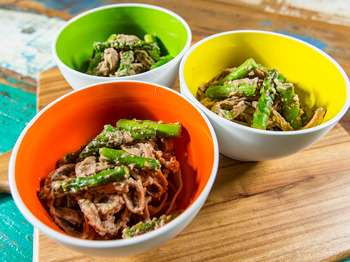 When pasta is cooked, combine mushroom sauce and diced asparagus. Serve immediately. Protein is a critical part of physical health. Vegans and Vegetarians often struggle to get enough protein in their diets, with many not meeting their daily requirement; and others resorting to protein powders to meet their macros. Herman Brot have created a suite of fresh, healthy and nutritious real foods that are loaded with protein. Their bread, pasta and muesli products contain pure plant-based protein derived from combinations of wheat, soy, lupin and rice, making them a perfect option for vegans and vegetarians. 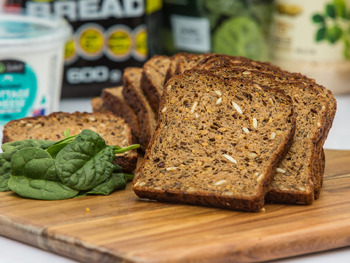 Herman Brot Lower Carb Bread delivers 25.6g of protein per 100g serve. Herman Brot Lower Carb Pasta has an astounding 39.4g of protein per serve. 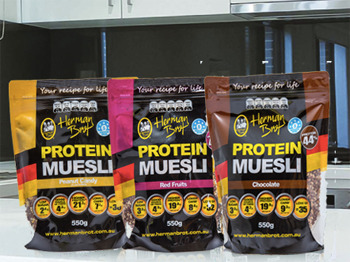 Herman Brot Protein Muesli is available in 3 flavours - Peanut Candy = 21.2g/45g serve (47% protein) | Red Fruits = 19.8g/45g serve (44% protein) | Chocolate = 19.9g/45g serve (44% protein). Herman Brot founder Christian Coenen said that since the Company's inception back in 2015, the number of vegans and vegetarians using their products has grown substantially. "We have received so much positive feedback from people who are after plant-based protein options and we are thrilled to be able to offer 'real' foods that can help vegans and vegetarians fuel up and achieve their daily protein quota. "Nutritionally all of our products are far more superior to a lot of the big name products on the market, and with the CSIRO recently highlighting that Australians are not eating the right types, or the right quantity of protein for healthy weight loss, we hope that the industry will start to highlight the benefits of our products, particularly to the vegan and vegetarian community," Christian said. As well as being high protein, all Herman Brot products are Lower Carb and Low GI (tested by SUGiRS University of Sydney). They also all have the five-star health rating. Review: After a recent PCOS diagnosis I reduced my consumption of carbohydrates in an attempt to decrease the symptoms I was experiencing which of course meant no bread… enter Herman Brot Lower Carb Bread – bread I could actually enjoy without 'cheating' on my diet. I'm not sure how Herman Brot have done it but this Lower Carb Bread is DELICIOUS! The dark wholegrain bread is moist and when toasted is extremely tasty. I know I've been restricting bread but I definitely think this is the best 'healthy' bread I've ever had. I was pleasantly surprised when reading the nutritional panel especially as the bread contains no artificial colours, flavours or preservatives. I'm not sure how they've been able to create such delightful bread with so many tasty seeds without the bread falling apart… it's a miracle - Herman Brot have truly nailed it! My only wish is that Herman Brot Lower Carb Bread was slightly more accessible as it is currently not available at my local supermarket but I'm willing to travel to eat this product. Herman Brot products are available at Independent Supermarkets and health food stores nationally and also available to order online via Herman Direct. For more information on each product and to order online visit www.hermanbrot.com.au. While pasta is cooking, heat 2 cups of the vegetable stock, whisk cornflour through until dissolved. Add remaining cup of stock and bring to the boil. Once thickened add asparagus and salt, stir, cover and cook on low for 5 minutes. Add parmesan cheese and stir. Remove from heat, add Greek yoghurt, lemon zest and garlic. Stir until smooth. Drain pasta and reserve ½ cup water. 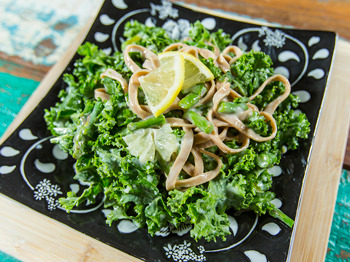 Stir in kale, lemon slices, pasta and reserved pasta water. Sprinkle with basil to serve. Question: What inspired you to create the Herman Brot range? Christian Coenen: There was a huge gap in the market for low carb, high protein and low GI products and yet there is a huge demand for it. Depending on their health issues or weight loss/muscle building goals many people are either after low carb, high protein and/or low GI foods and we've created staple food products that fit into each category, that actually taste good. People wanting more protein no longer have to resort to just having protein supplement powders, drinks and bars, they now have more real food options to choose from. Our products are all plant based as well, making them suitable for vegans and vegetarians. 5 years ago I had Type 2 Diabetes and was a ticking time bomb, so I used my bread which is extremely Low GI (good for Diabetics) as my staple food and combined with exercise I lost 60kg in 10 months. I found that the high protein levels kept me full, the Low GI was very good for my Type 2 Diabetes (which I have since reversed) and the Low Carb was good for weight loss. The challenge for us was to combine the tradition and experience of more than 160 years in the food industry with the rapidly increasing requirements of a modern society. Question: What protein is used in this Herman Brot range? Christian Coenen: We use pure plant protein that is derived from wheat, soy, lupin and rice. Question: What are the nutritional benefits of protein? Christian Coenen: Protein has a positive effect on weight management. It fills you up and helps reduce food cravings resulting in better appetite control. Consumption of protein also helps with improved body composition – greater fat loss and less muscle loss. Question: How much protein should we consume, a day? Christian Coenen: The DRI (Dietary Reference Intake) is 0.8 grams of protein per kilogram of body weight, or 0.36 grams per pound. This amounts to: 56 grams per day for the average sedentary man. 46 grams per day for the average sedentary woman. However the CSIRO states that a recent FAO report(18) published in 2013 recommended a population estimate of 0.99 g protein/kg/day, suggesting that prior protein requirements were too low. Question: Can you talk about the creation of this range? Christian Coenen: The Herman Brot range includes bread, pasta and muesli – 3 out of 4 of the most popular staple foods (rice being the other). We will also be adding another exciting product to our range very soon. Our aim was to provide staple foods that can be enjoyed for breakfast, lunch and dinner. We provide bread (for breakfast or lunch), muesli (for breakfast and snack) and pasta (for lunch or dinner). So there is something for everybody. All of our products are tested by the University of Sydney *(SUGiRS) and have been recommended as being suitable for inclusion in the diets of people with Type 2 Diabetes. We work closely with NMI (National Measurement Institute) and are also included in the CSIRO weight loss books. Partnerships with these organisations help to showcase that Herman Brot is a company that prides itself on creating staple foods that are nutritionally good for people.